Say the word Colorado and most people think of the mountains. With an average elevation of 6,800 feet, Colorado is the highest state in the nation. In western Colorado, the continental divide forms an enormous Rocky mountain chain with 59 peaks extending 14,000 feet or higher. The eastern portion of the State consists of low-lying areas, resembling the flat plains of neighboring states like Kansas and Nebraska . In between the mountains and the plains, Colorado's Front Range is aligned from north to south. This region contains the largest cities and the majority of the population of Colorado. During the winter months, the steep terrain offers abundant snowfall in the high country, but as summer approaches, large temperature spreads and variations in topography can lead to an outburst of severe weather, including the formation of tornadoes along the Front Range. Tornadoes are reported at least 9 months of the year, with June being the most active month. Tornadoes are prevalent statewide, but most tornadic storms develop out over the eastern plains, east of the I-25 corridor. One wouldn't expect a tornado to rip through the heavily populated metropolitan area, but it is more common than you might think. The population along the Front Range has grown drastically over the years, which means tornadoes which used to strike in the open country, are now hitting today's eastern suburbs. In fact, a tornado outbreak in Denver back in 1981, lead to the discovery of a mesoscale phenomenon known as "The Denver Cyclone". After years of research, this feature was formally named the Denver Convergence-Vorticity Zone (DCVZ). In this paper, I will aim to better understand the DCVZ and its ability to spawn tornadoes along Colorado's Front Range. The American Meteorological Society defines the Denver Cyclone Convergence Zone as a mesoscale feature of convergent winds, 50 to 100 km in length, usually oriented north-south, just east of the Denver area. After years of analyzing the DCVZ, researchers are better able to understand the atmospheric set-up that leads to the development of this convergence zone. The north-south wind component is generated by a low-level southeasterly flow, combined with topographic forcing by a ridge of higher terrain. That ridge is known as the Palmer Divide and extends eastward from the Front Range, just south of Denver. The "Divide" juts out from the Rockies with an average elevation of 7600 feet. If air is being forced from the SE, it is most likely a moist air mass moving up from the Gulf of Mexico. Once this air is lifted over the divide, it converges with a northwesterly wind coming off the foothills. This zone of converging winds can create small-scale cyclonic vorticity. (Szoke et al. 1982). The diagram below illustrates "The Denver Cyclone" overlaid on a topographic map. As you can see, the SE wind component flows up over the Palmer Ridge, otherwise known as the Palmer Divide. As the air flow meets up with the wind coming down off the Front Range foothills, a zone of convergence develops, as indicated by the blue dotted line. Climate data from the 1980s indicates that when a well-formed DCVZ is present in June, there is a 70% chance of a tornado forming somewhere in or near the zone. (Edward J. Szoke, June 1997 FSL Forum). Storms created by the DCVZ are a major concern for Denver, especially during the spring and early summer. Deadly cloud to ground lightning strikes, heavy rain, possible flooding, severe hail and tornadoes are all possible when this feature is present. One particular case study dates back to the afternoon of June 3, 1981. On this unusually humid day, two F2 tornadoes moved over portions of the populated metropolitan area. 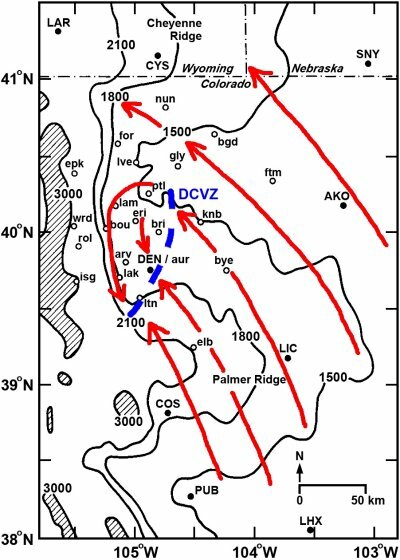 Details on this particular event, including 10 other nonsupercell tornadoes in the vicinity of the Denver International Airport all appear to have a connection to the DCVZ. (Szoke, E. J. in 1982). In addition to the studies above, eight separate DCVZ events were analyzed by the Mobile Mesonet during the summer of 1998. Based on the observations, the boundary varies in horizontal extent at measurable scales from ~100 m to a region several km across. Observations also yielded numerous cyclonic eddies traveling along the boundary, ranging in size from 200 m to 4 km in diameter. Of the eight events, a total of 11 vortices were identified. (Albert E. Pietrycha and Erik N. Rasmussen). Continued research is our only means of understanding the DCVZ. While the synoptic scale features associated with this phenomenon are well documented in several of the studies above, translating that into an accurate forecast of tornadogenesis will always be a challenge. Most importantly, it is crucial to know the topography of your forecast area, especially in a state as variable as Colorado. Whether it is upslope flow resulting in substantial snow amounts, or tornadogenesis in relation to "The Denver Cyclone," understanding the region will play a big role in delivering accurate forecasts. Complex radar networks will help to provide better coverage of the DCVZ boundary and vertical vorticity, but proximity to the radar will always be a limiting factor. "Observations of the DCVZ using Mobile Mesonet Data," Albert E. Pietrycha and Erik N. Rasmussen.